Wader Quest: Norfolk Bird Race 30th April 2016: please support it. 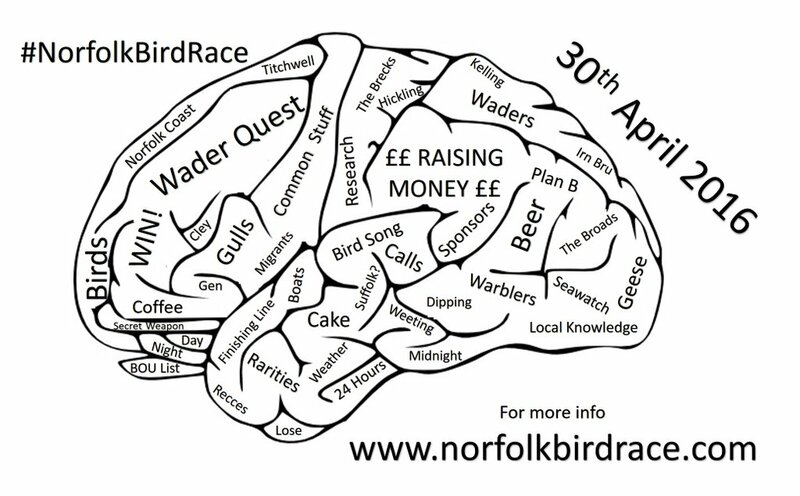 Norfolk Bird Race 30th April 2016: please support it. The Norfolk Bird Race is coming up. If you support it, and we hope you will, here's an idea about what you will be helping to fund. Bear in mind 100% of all donations received by Wader Quest will be used for wader conservation. Recently we have supported a number of projects including Conectando os Pontos a Brazilian project designed to put flags onto Nearctic waders as they travel north. The flags have been purchased by Wader Quest and are on their way to Brazil as we speak. Another project to which we recently purchased and sent a pair of Opticron binoculars and an Opticron telescope is the Nature's Valley Trust project that is investigating beach nesting waders' success in South Africa. 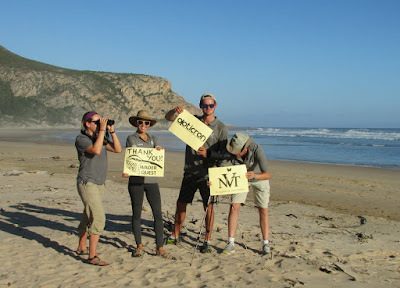 Our contribution meant that we had the honour to name two of the chicks, a White-fronted Plover and an African Black Oystercatcher. The plover we decided to call Dinah. This is after my (Rick) late godmother Dinah Dean a prolific writer of Mills and Boon historical romances. The oystercatcher is named David after my late Brother David Simpson who died in 2013. He was a great supporter of Wader Quest. The team at Nature's Valley Trust sent us a package recently with the certificates including photos of 'our' birds. We hope they both do well and make it to fledging age, or even better, make us grandparents in a year or two's time! In the package was also a lovely print of an African Black Oystercatcher by local artist Dawn Pearce. We also have a Nature's Valley Trust car sticker, the most northerly of its kind we believe, soon to be stuck in the car. Lastly, but certainly not least, there was an attractive card written by hand personally by Selena Flores one of the project leaders, the picture on the front of which was another Dawn Pearce's paintings, this time of the White-fronted Plover. I cannot express enough how grateful myself, the shorebird team, and the Nature's Valley Trust are for your generous contribution to our research. The optics have incredibly increased our capacity to gather lots of observational data for meaningful results from this study, which is so important for White-fronted Plovers (and oystercatchers too!) of the Garden Route. Thank you again for you continued support of this project and wader conservation efforts around the globe! - Selena Flores. We have already posted this photograph, but it is worth posting again with the Nature's Valley Trust shorebird team saying thank you in a novel way. We would like to thank Wader Quest Founder Corporate Sponsors Opticron for their help in making the purchase of these items affordable for us. All this and much more was only possible because of the support we have received, any charity, large or small, is only as effective as the support it gains, so the 'thank you' should really go to all of those who have joined us as a Friend of Wader Quest, a Corporate or Club Sponsor, or made a donation to the charity. Remember all donations of £5.00 or over attract a year's free membership as a Friend of Wader Quest and a chance to win a Lars Jonsson poster! Wader Quest is wherever the waders are!